LG's cheapest 4K OLED TV ever. Nuff said. As the cheapest model in LG's 2016 4K OLED TV range, the £2,300 OLED55B6 lacks the build quality and design prowess of its more expensive siblings. Its sound is relatively flimsy, too. But crucially it still retains the same excellent smart TV system and, even better, its picture quality is nearly as good as that of LG's flagship OLED model. The appeal of the LG OLED55B6 is brutally but brilliantly simple: it's LG's cheapest Ultra HD OLED TV of 2016. 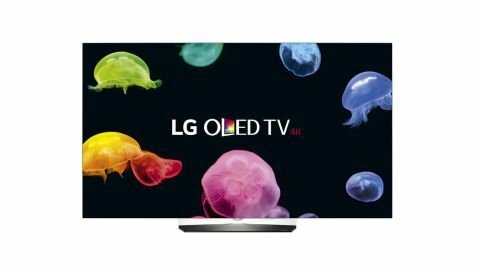 Which for most households will mean that it's their best shot at getting their hands on LG's latest - and easily greatest - take on the OLED picture technology so revered by AV enthusiasts. Naturally the OLED55B6's status as LG's most affordable OLED option does come with a couple of strings attached. We'll go into more detail about these later, but briefly it's relatively weedy on the audio front, and doesn't look quite as ridiculously stunning as its posher OLED brethren. Crucially, though, when it comes to picture quality the OLED55B6 uses essentially the same OLED 'engine' at its heart, and as a result produces pictures which are, as we'll see, only marginally less outstanding than those of even LG's flagship OLED model this year. The OLED55B6 combines a 55-inch screen with a rear that's less than 5mm deep at its edges. This skinniness immediately marks it out as an OLED TV, and works in tandem with a very narrow frame around the image in making the set look both futuristic and drop-dead gorgeous ... albeit not quite as drop-dead gorgeous as LG's other 2016 OLED series. Its OLED 'film', for instance, is not mounted directly onto a sheet of glass like it is with the extraordinary-looking OLED E6 and G6 models. Also, while its rear is incredibly narrow at the screen's edges, it does stick out a little further than the E6 and especially G6 models, the latter of which shift all of their electronics into their bases so that their rears stay less than 3mm thick across the entire screen area. The OLED55B6 lacks the curved screen of the similarly priced OLED55C6 model in LG's current range - though while this stops it looking quite so glamorous, for many AV fans the OLED55B6's flat approach will actually be preferable, as it won't suffer the distorted reflections and viewing angle limitations curved screens cause. One last point to make about the OLED55B6 is that its 1229 x 715 x 48.6mm form doesn't leave much room for built-in speakers. There's no sign of the sound bar solutions attached to its E6 or G6 OLED siblings either. So presumably sound quality will be compromised. Design TL;DR: Although the OLED55B6 isn't as unprecedentedly beautiful as LG's premium E6 and G6 OLED series, it still outshines pretty much all LCD-based models in the show room. The OLED55B6 is pretty much state of the art where its smart features are concerned. This is thanks in no small measure to its use of the third generation of LG's webOS operating system. The benefits of webOS are five fold. First, it provides access to all of your content sources via an overlaid scrolling onscreen 'folder' system that takes up remarkably little screen real estate, meaning you can easily keep watching TV while you browse. Second, the organisation and layout of the webOS interface is exceptionally logical and straightforward, with minimal reliance on tedious submenus and third, organising the simple 'strip' of icons so that it puts your preferred apps first is child's play. Fourth, the system works incredibly slickly, zipping through options quickly but also accurately, giving even technophobes a sense of control that's rare indeed in the smart TV world. Finally, webOS shows a superb understanding of the sort of visual cues that help people always know exactly where they are in an onscreen menu environment. While webOS has always been a hit in ease of use terms, it has historically lagged behind a couple of rivals when it comes to the number of online content options on offer. LG has put this right in 2016, though, by introducing Freeview Play. This provides catch up apps for all the main four UK terrestrial broadcast TV services, as well as letting you access their on-demand stuff via an easy to use backward-scrolling electronic programme guide. It's worth pointing out here that weirdly Freeview Play is not found on LG's flagship G6 OLED TVs – so the entry level OLED55B6 actually has an important feature its vastly more expensive brother does not. Smart TV TL;DR: WebOS hasn't evolved much from its previous generation - but it didn't need to. It's still the easiest to use and most effectively designed smart system around. The OLED55B6 is simply deliriously good with standard dynamic range content. The HDR-motivated OLED improvements LG has introduced to overall brightness, light uniformity and the handling of light at just above black this year mean the OLED55B6 can produce SDR pictures more or less effortlessly. So effortlessly, in fact, that they join the efforts of LG's E6 and C6 OLED models in being arguably the finest SDR pictures the TV world has ever seen. The relatively limited brightness range of SDR content, for instance, fits comfortably within the OLED55B6's spectacular combination of class-leadingly deep black colours and punchier whites/colours than we've seen before from any previous OLED TV generation. What's more, because every pixel in an OLED screen produces its own light rather than sharing an external light with its neighbours, the OLED55B6 delivers even the tiniest shade shift or shadow detail with absolute authority and clarity. OLED's pixel-level lighting means, too, that even the very brightest image elements don't produce clouding, haloing or striping problems in the 'backlight' of the sort you see to some extent with all LCD TVs. Colours look rich but also exceptionally natural and subtle too, as LG harnesses OLED's innately strong colour reproduction to the brand's most robust and accurate video processing system to date. The only issues I have with the OLED55B6's SDR performance are that with 24p sources, at least, the set's motion handling and processing can generate some distracting side effects, and that LG's upscaling of full HD content doesn't deliver quite such sharp, detailed results as some rival systems. HD/SDR performance TL;DR: The OLED55B6 joins its 2016 OLED siblings in delivering for my money the finest SDR pictures the TV world has ever seen. Much as I love the impact high dynamic range (HDR) technology can have on TV picture quality, there's also no doubt that it's causing the current generation of TVs some real problems. OLED's HDR problems are different to the backlight clouding problems associated with LCD, but they're problems nonetheless. Chief among them, as evidenced by the OLED55B6, is the way detailing and subtle colour toning is 'clipped' from the brightest parts of HDR images. This is due to the screen only being able to achieve a peak brightness of around 650 nits when HDR content is generally mastered to anywhere between 1000 and 4000 nits. The same brightness shortfall also means that dark parts of HDR images can sometimes look a little dominant in the picture, and lack a little shadow detail. Nor do you get the full impact that the brightest end of the HDR spectrum is capable of delivering on a brighter screen. It's important to stress here that I'm talking predominantly about the OLED55B6's handling of the HDR 10 standard. With Dolby Vision HDR, which all of LG's 2016 4K OLED TVs support, the HDR performance is considerably more refined, with much less clipping in bright areas, and a more comfortable balance between dark and bright picture elements. The Dolby Vision HDR approach does take a less overall bright approach than the 'standard' HDR 10 approach, which underlines just how much brighter the best LCD TV rivals can go with HDR. But overall the prowess of Dolby Vision over HDR 10 on the OLED55B6 makes me wish there were more Dolby Vision sources out there to play on it. Even with HDR 10, though, it's important to stress that the OLED55B6's OLED technology also delivers a couple of considerable HDR upsides. First, no LCD TV I've seen so far can deliver the dark end of the expanded HDR light spectrum with as much authority and depth as LG's latest OLEDs. Even better, when an HDR image features very bright objects against a dark backdrop - like streetlamps against a night sky - OLED's pixel-level lighting means the bright object can appear without so much as a hint of the light blocks, stripes or halos around it that you inevitably get with LCD screens. For many AV fans this twin hit of class-leading black reproduction and zero light 'leakage' makes OLED irresistible. And the OLED55B6 delivers these strengths to almost the same standard as LG's much more expensive E6 and G6 2016 OLED TV series while costing significantly less. The OLED55B6's motion issues persist with 4K HDR content, and actually look slightly more pronounced than they do on LG's E6 and G6 models. There's also a touch less brightness than you get with the E6 OLEDs, and a touch less all-round refinement - especially in the colour department - than you get with the flagship G6 models. But the differences are strikingly minimal considering the gulf in price. Normally I'd include some thoughts on the OLED55B6's 3D performance in this section, but the B6 series is the only one in LG's 2016 range that doesn't support 3D playback. 4K/HDR Performance TL;DR: Limited brightness prevents the OLED55B6 from hitting quite the same class-leading picture heights with HDR that it does with SDR, but its impeccable light management during dark scenes still hands it an advantage many AV fans will find hard to resist. I predicted in the design section that the OLED55B6 probably wouldn't sound as impressive as LG's E6 and G6 OLEDs, and my suspicions prove founded. The OLED55B6 lacks the power to really project its audio, leaving action scenes sounding slightly cramped and swallowed. There's not much bass to speak of either, and the sound stage the TV produces doesn't have much scale to it, leaving it feeling slightly out of kilter with the large size of the screen. There is some good news to report, though. Namely that the speakers are accomplished enough not to succumb to drop outs, crackles or buzzing interference even when you push them to the limits of their capabilities. Sound Quality TL;DR: The OLED55B6 sound much less impressive than LG's more expensive OLED options, and in truth only sounds average versus the wider TV market too. Although the OLED55B6's picture quality gets remarkably close to that of LG's more expensive E6 and G6 OLED series, those other models do deliver a marked step up in the sound and design departments. The C6 models also offer a curved screen if you fancy one of those, and all three of LG's other 2016 OLED ranges support 3D while the OLED55B6 does not. When it comes to LCD-based alternatives, the Samsung UE55KS9000 delivers a much brighter HDR picture that doesn't suffer clipping in the brightest areas. This brightness also helps its HDR colours look bolder with HDR. However, its edge LED lighting system can cause light banding around very bright objects. Also worth considering is the Panasonic TX-58DX902B. This is three inches bigger than the OLED55B6, and uses direct LED lighting rather than the Samsung 55KS9000's edge LED lighting system, resulting in smaller areas of light pollution with dark HDR scenes. For much of the time its HDR pictures really are outstanding, with exceptional brightness peaks and detailing that the LG OLED can't reach. The only catch is that while the backlight halos around bright objects in dark scenes are limited in terms of the screen area they cover, they're quite pronounced in their intensity. One final alternative is the Sony 55XD9305 - or actually the 65-inch 65XD9305 is available for roughly the same money if you can handle a bigger screen. This achieves some gorgeous HDR colours and incredible 4K detailing, but dark scenes can reveal some distracting blocking in the backlight. If you saw our review of the LG OLED65E6 and wished you could afford it, or you read our review of the curved LG OLED55C6 and wished it was flat, then the OLED55B6 could be the answer to your prayers. After all, its OLED panel is built of the same core stuff as LG's more expensive OLED models, and as a result produces pretty much the same mostly outstanding picture quality - especially with standard dynamic range sources. Black levels and lighting uniformity in particular are mesmerisingly good, and colours are beautifully rich too. Its lack of brightness versus the latest LCD TVs slightly compromises the punch and bright detail of its standard HDR 10 experience, but the more subtle Dolby Vision HDR system proves a welcome addition to LG's spec sheet, making us wish more Dolby Vision sources were around. Despite its relative affordability the OLED55B6 also still looks spectacularly slim by general TV standards, and it still carries LG's latest - also, excellent - webOS 3.0 smart TV system. The only really substantial performance compromises versus its more expensive brethren are its lack of 3D support and rather average sound quality. Neither of which, I suspect, will prove deal breakers by the time OLED fans have taken the OLED55B6's price into account.